What Did Anna Wintour and Cardi B Talk About at Fashion Week? New York Fashion Week brings together all sorts of unlikely pairs: the color orange and zebra print, Pornhub and the fashion industry, and, most recently, Anna Wintour and Cardi B. The two sat next to each other at Alexander Wang’s New York Fashion Week fall 2018 show (his last) in the old Condé Nast building — specifically the old New Yorker offices. New York Times reporter Matthew Schneier captured the magical moment the two met. Both are front-row regulars in their own right, but we’d kill to be sitting in between these two. Did they discuss the art of the hustle? Will Cardi now get a Vogue cover? Did Cardi’s outfit get the AWOK? 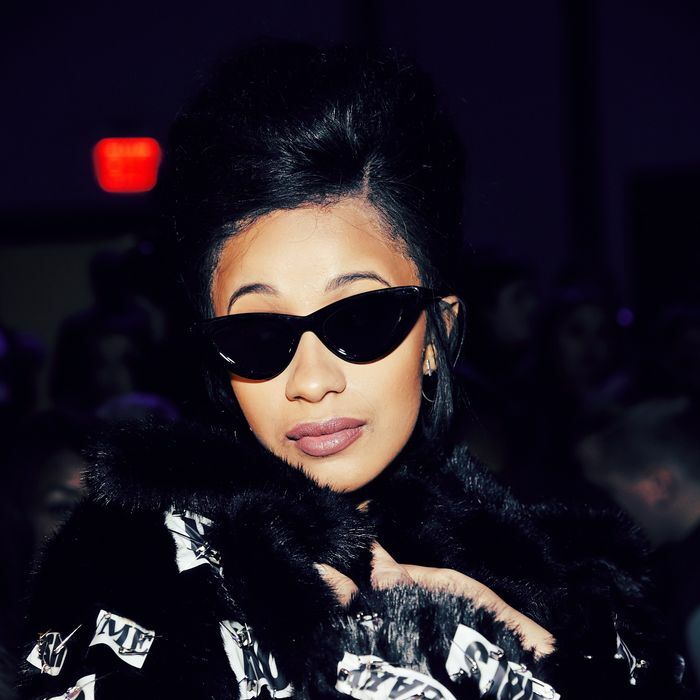 Cardi was certainly dressed for the show in her thigh-high leather boots, headdress, and trench-coat dress. Wang marched an army of Matrix-y office drones, accessorized with tiny sunglasses, down the cubicle-style runway to soothing jazz music. All-black ensembles, bedazzled sweat suits, and full-length shiny black coats just added to the postapocalyptic vibe. Kaia Gerber, who opened Wang’s last show, carried a sparkly Ziploc bag down the runway with her. Other Wang soldiers/co-workers chose furry handbags or giant backpacks. Anything goes in the Matrix! When asked about the venue before the show began, Wintour told the Cut, “The light’s a bit harsh,” and said the Vogue offices had been “down in the cheap seats” instead of on the top floor like the New Yorker. Emilia Petrarca contributed to reporting. What Did Anna Wintour, Cardi B Talk About at Fashion Week?